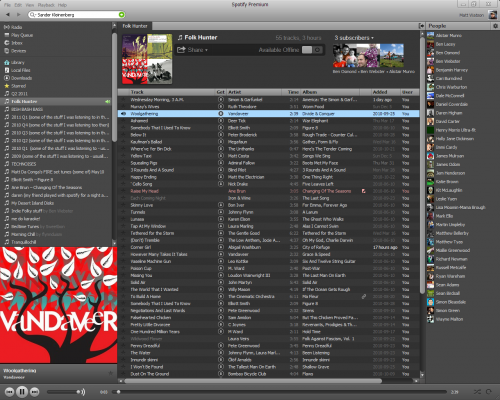 A screenshot of my Spotify – one of my favourite applications of all time. When someone asks me “what is Spotify?” I answer “An application that gives you any song you want within one second.” And whilst that’s not entirely infallible – there are great swathes of music conspicuously absent, it does have over 13 millions tracks available. New released tend to hit spotify fairly quickly, back catalogues seems to grow and the choice of music is very varied. I use the premium service – this strips out the adverts, gives me unlimited play and gives me the top quality stream. I don’t really buy CD’s any more – I used to typically spend the £10 I spend a month on CD’s but now, I just have spotify and I can have as much new music per month as I like. The paid service also alows me to have spotify on my Android phone so I’ve got all my tunes, on the move. A portable WiFi HiFi (and 3g). My only gripe really is the flat ‘file’ structure – it would be so nice to be able to organise playlists into folders and attribute and use my own meta data. They seem to be working on the social side of music quite well. You can share your music with other people as a link (eg’s below) and hook it up to your facebook – so that you can see what playlists your friends have. A few years ago there was a service available in the UK called Pandora (sadly, no longer available, thanks to legal and money people taking their bat and ball home on that one). This used a concept called The Music Genome Project to learn about your music taste. On a simple level it worked out if you liked Band A and another person liked Band A who also liked Band B, chances are you would like Band B also. The more you played and liked or disliked, the better it got. There’s a similar concept going on with last.fm. Using a system it calls ‘scrobbing’ , last.fm learns what you like and offers recommendations based on a mathematical matrix of what you like. You can scrob what you are listening to – in a lot of the popular music listening applications including spotify. Sharing and scrobbing, along with traditional music journalism is how I tend to source new music. I often listen to about 4 hours of music a day. I yearn new music all the time. Much in the same way I never read a novel twice – as I feel the world has so much out there and I’ve only got so much time to cram it all in. I’ve been curating playlists – some throw together, some meticulacy gardened. Why not take take an ear look at the culmination of years of my musical listening pleasure.. Mainly acoustic, mostly made to sound so simple new to new ish folk. New technology has allowed people to make some incredible new noises. Some of this has been tagged as ‘Dub Step’. Mainly techno , 4’4. One of my first musical genre loves. Sleepy head / can’t sleep and need some chill choons type stuff. All of the above are a ‘work in progress’. Subscribe to them! Since the start of last year I’ve been keeping a rough bookmark of things I’ve been listening to – the first track of each album. More of an ‘aide memoir’ than anything else. As a foot note, I’ve got about 30 Spotify invites should anyone I know want one. (there’s a Premium service, and a free service – but I think the invite token gives you slightly more that the standard free service). I would say – try out the pro version though. It’s worth its salt.